Hewlett-Packard (HP) on Tuesday announced the release of the MediaSmart EX490 and EX495 Home Servers. They’re available for pre-order for $549 and $699 respectively. MediaSmart devices are billed as “all-in-one” home servers that act as a central point for network backups for your home computers. They also act as media servers for any music and video you’d like to share. Included software centralizes the collection of media to keep it in one place. HP touts the new MediaServer products’ improved Mac OS X support: Administration media collection and disc recovery are all supported on the Mac. Users can now do “bare metal” restorations on Macs that have been backed up through Time Machine. 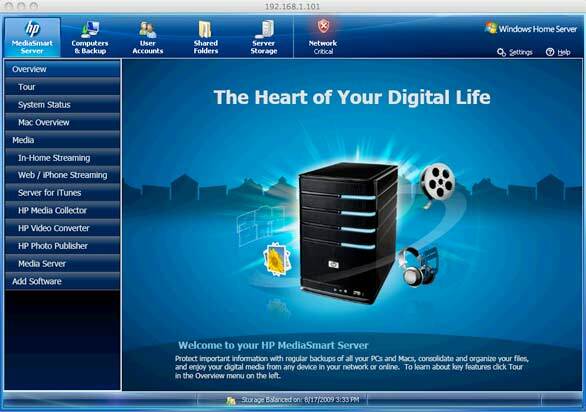 HP also offers a free app from the App Store called HP MediaSmart Server iStream. It lets you connect to your MediaSmart server using your iPhone and iPod touch, streaming audio, video and photo content anywhere you have an Internet connection. The software also supports HP’s previously-released MediaSmart EX485 and EX487 models. The EX490 and EX495 both support Mac OS X and Windows backups (Macs are supported through Apple’s own Time Machine software, while Windows PCs are supported using Windows Home Server Backup). MediaSmart servers can also centralize media collection for iTunes and iMovie on the Mac, and can connect to photo sharing Web sites including Flickr, Picasa Web Albums, Facebook and others. The EX490 comes with 1 terabyte (TB) of storage capacity, while the EX495 comes with 1.5TB of capacity. Each device sports three additional Serial ATA (SATA) II-compatible hard disk drive trays, and four USB 2.0 ports let you expand storage capacity further. There’s also an external Serial ATA (eSATA) port. The EX490 and EX495 both connect to the network using Gigabit Ethernet. Compatible with DLNA and UPnP standards, the MediaServer works to stream audio and video content to Microsoft Xbox 360 and Sony PlayStation 3 video game consoles. It supports iTunes. The server includes video conversion software so you can more easily play back video content on different devices using the MPEG-4 (H.264) video standard, and can create mobile versions to play back video on portable media players like an iPod, iPhone or PlayStation Portable. HP’s Web site had not been updated with information about the new servers as Macworld posted this article.